I did the same tests for fun with a 1060 GTX, 4790K, 32 GB CL10 DDR2400 RAM and I get ~ 45-48 FPS on LOW and 23-26 FPS ULTRA average on YAAB. So there are some GPU scaling vs Ryzen with Vega 64 as there is Ryzen is equal or greater than Haswell in IPC. But online, I get 45-60 FPS Ultra as all the AI has been shifted to server CPU. If I disable AI or just load a map and walk around, no mods, I get well over 60 FPS. But as soon as I load ACE or other mods with a lot of scripting, it dropped. For fun, I was testing zombie mods - loaded ALL of them and wanted to see how each Zombie unit type compared and I was was running between 100-200 zombies at once in VR with no problems once the AI cached. I wonder if users can just copy and paste that optimization into each game script or just make a blanket mod to redirect the eventhandlers to improve cpu performance? Sorry for going OT. What is the frequency of your 4790K? Have you selected XMP profil in the BIOS for you 32 GB 2400 MHz RAM? Otherwise it runs at like 1333 MHz with high latencies. it's not enough to just plug it in the motherboard. Don't forget you have a GTX 1060 with less vRAM and less cores that is the limiting factor @ 1080 ultra vs. 6 GB GTX 1060 that provides max FPS @ 1080p ultra. No idea for the rest, sorry. Built my computer yesterday, will run the benchmark when I get my gfx next week. I double checked my settings and it WAS set to DDR1333 in the BIOS! Slaps forehead! It must have reset during of the hot summers days! Thank your for pointing out! I went back and tweaked my system, ran YAAB with no mods, 64 bit. G.Skill DDR3-2540 MHZ CL10 OC'ed, 32GB!!! 1.65 volts stock. 1060 3GB GTX - I know, its only a temp GPU... I was looking for a 580 when I bought this but my country was sold out!!! So I will consider buying a better GPU in the future for 4K or more. Much better! At least 10 FPS gain on almost every setting. I will do some online testing now. Only issue is that I need to keep a FAN on top of the RAM Heatsinks to keep it cooler but that is much more economical compared to a new MB/CPU/RAM upgrade! 140 MHz DDR3 RAM more is 0.5-1 FPS more, avg. - not even min. Under or over 100 MHz BCLK is not good for the CPU and components related to BCLK. If your GPU is limiting @ 1080p ultra preset, then run YAAB @ 1080p standard preset without changing anything inside of it for results comparison consistency between users, at least for the YAAB runs. This way we all just have to select a certain preset and run YAAB and compare easily. Otherwise it will lead to many changes/adjustments here and there from different users and we'll be lost in numbers, leading to "wrong" results. The last run was on my custom Ultra setting - 3800/3800 distance and models with CMAA, no SMAA, no blur. It is almost the same as before vs lower CPU + higher DDR speeds. I want to try to OC the cpu further but my cooling is not that great so am happy with what I have. I have no idea how to stabilize OC the cache so left it at 4.0 GHZ. PS: the low - S preset is setting LOW in video, then pressing S before benchmark start. It creates a weird hybrid LOW - STANDARD setting but its there for reference. Everything else was set only via the video preset, no mods, all stock. GPU OC has NEGATIVE EFFECT on LOW + STANDARD. GPU OC + 9% @ Ultra - makes sense. I wonder if you guys know the best timings for memory DDR4 Vengeance 3000Mhz . I'm running them now at (15-17-17-35) but could I go any lower? Will that give some performance improvement? @nikiforos I suggest you do a search for the best timings. There are websites that do tweak and OC RAM such as overclockers.net. Lets not forget that Ryzen 3XXX L3 cache is splitted in 16 MB per chiplet and 32 MB inside of the I/O-Die. Whereas the i7-5775c has its 6 MB L3 cache in one piece and whopping 128 MB L4 cache, also in one piece. In my opinion - Ryzen is doing very well. Considering that it wasn't even running some decent 3600 MHz 14-14-14-32-2 single rank RAM sticks with tuned secondary and tertiary timings. Will may be consider it when upgrading in 2020/2021, if Intel won't deliver. Have edited/updated my previous post! Lets first see how much they will cost. I'm afraid that it could become more expensive if IPC and frequency gains will be true to what's being discussed currently. Well, seems there are some solid guesses about that... I believe the 3700x ( and the 3850x is just a.... BEAST... 16c/32t at 5.1 GHz, only 500$) is planned to be 320 US $ ( I mean...12c/24t, 5.0 Ghz, for 320$??? ). Not expensive in my book, for that range of freaking power (and after that amazing cinebench test where it even gets better results to a non overclocked 9900k, it's clear that not at the cost of consuming too much power. To say it lightly). And the rest of the gama, all that kind of great bang for the buck. I wouldn't worry bout that, but mostly on when they'll come out. It seems it could be as late as July. And I have zero data yet on when they will release (seems current latest chipsets are going to be more or less compatible) the chipset that really fully support all to full advantage. Thanks for making this comparison. I made another one based on the same leak of the ZEN2 ES sample from last week. I compared it to the current incarnation of the Zen µArch. Of course this always needs to be taken with a grain of salt. This is an ES with non final AGESA and UEFI Firmwares and it only clocks at about 3.7GHz. Yet, I think it appears that the outsourcing of the memory controler in Zen2 will roughly cause a 10ns Latency penalty over the Zen+. 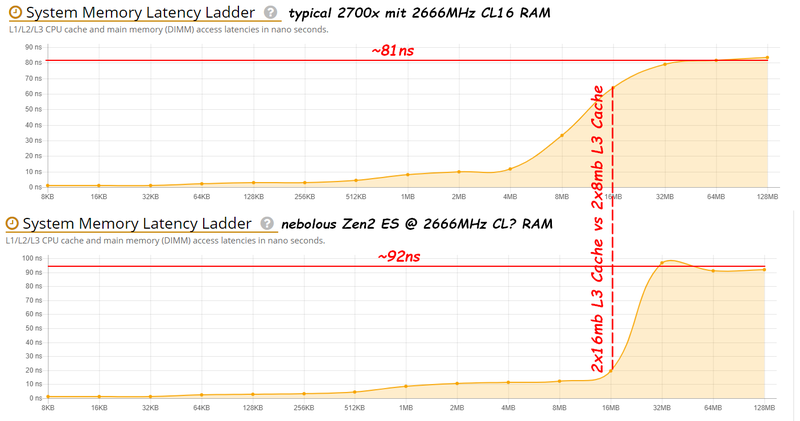 On the other hand, its pretty save now to assume that Zen2 will double L3 Cache and will come with 32mb L3 Cache that performs fast at a latency of only ~10ns. So for ArmA3 there is good and bad. RAM Latency gets worse, double (32mb 10ns L3!) Cache will however for sure absorb many cache misses. Its very hard to predict what the result will be. With some friends we are just about to start some small RAM Review Channel and I am sure we will be able to review Ryzen 3k soon after release. And I will make sure we include ArmA3 ;-) Will let you know! Do you have cache latency of Intel 7700K, 7740K, 8700K or 9700K? It would be good to compare to those vs both Ryzen and 5775c for ARMA. Nice overclock! Does anyone have such a CPU here? Maybe @Dwarden can give an idea of what to expect from large caches (e.g. 32mb L3 in Zen2 or the eDRAM in 5775c). It's a guy from overclock.net. You gave us no info on the SSD your "predator" is featuring. With a high level laptop like this one the limiting factors for Arma3 are coming from the weakest link. Having Windows and Arma3 on the same SSD is mandatory. - best Post Process solution is related to the way you GPU driver is dealing with screen performances, so you must test by yourself. i have 2 SSD's OS is on one, and all my steam games are on the other, i find performance for Arma3 pretty good. I have also 2 x 500 Go SDDs, one for Windows and the other hosting Arma* games. So what I think is mandatory is to get Windows and Arma3 on SSD. My answer was related at what I know about "Predator" laptop, more often a small SSD and a large 5400rpm HDD. In that case, what is mandatory is to get Arma3 library on the SSD, not on the HDD. Hi guys, what cpu/mbo/ram you recommend for nice fps in koth mainly. Most of the time i play on epm hc and eirnacken whatever its called hc servers(objects ultra, terrain low, 8x aa)@1080 res. And in the city i got on 1000-1500 view distance around 30-50 depends on how many players and position etc. Sometimes it drops below 30. From my point of view your PC is working fine, playing in the 30/50 FPS range is good and you will need a rather huge spending to gain a bit. Having stable 40-60 in city is a goal many are dreaming of, but I am wondering if only one had got such an achievement IRL. Many will show benches explaining that an [i7 - 8900K / Z390 MoBo/ RTX 2070 / 16 GB DDR4 @ 3200] based combo will help a lot. That's true. But such upgrade comes at a price. Will this system run ArmA III? I really don't want the hassles associated with ArmA 2/OA on Steam. Yes, this "system" will run Arma3 but not the way you are looking for. Let say the whole thing is unbalanced. CPU /RAM too high vs GPU/HD too low. The GT 1030 is playable [I know, I have one] but it will always run at 100% in game with a lot of limitations. A 2To HDD is also playable, but you will get stuttering and texture flickering. - the fastest and more efficient CPU you can get : it has been the case for all Arma* games. - a rather good GPU. Before Visual Upgrade, even a low entry graphic card can do the job, now, you will need a middle range one as a minimum. - 8 RAM of fast -@3000 MHz- RAM is mandatory. Arma* have always been "RAM sensitive", now its also "RAM greedy". - 256 GB SSD is also needed. Arma* have always need fast HD, now with a lot of data streaming in, the fastest is needed. HD : 240/500 GB SSD. Windows 10 64 and Arma3 library on SSD. Be advised French language involved. RAM : 8 GB RAM DDR4 (2x4) @3000 MHz or 16 GB DDR4 if you are thinking to play over 1080p.